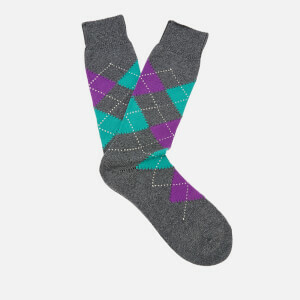 Men's printed socks from Pantherella with an Argyle pattern. Crafted from high quality, long staple Egyptian cotton that has undergone a Mercerisation process to create a shiny, shrink and pill-resistant yarn. Adding a premium touch to your attire, the 'Turnmill' socks are complete with a ribbed ankle cuff and signature branding at the footbed.